Okay so today is my mother’s 80th birthday and nobody can believe she is that great age because she looks so young. We met up at the nursing home at 11am so that Anthony and I could give her ‘the book’ together and (sigh of relief) Meg loved it, despite its falling apart with messy fullness! Then we went out for lunch with a sprinkling of special people with the surprise star being Meg’s first great-grandchild who has just turned 1. On Saturday we have the party, a 2-hour boat cruise which is just family because, if we had to include friends, it would have entailed a ship! Ashtyn is Meg’s first grandchild, my fantastic first niece, my god-daughter, Ming’s godmother and, in so many other ways, the star of the family. She and Meg are very much alike in that their presence at any occasion elicits a lot of attention because they are both so beautiful! Note: I will CHANGE the subject tomorrow! Can we see a photo of the book? Pleeeeeeeeeeease? You must never refer to this absolute masterpiece as messy again! It is the most creative, stunning, memory-filled and humbling work of art and probably the most treasured possession I will ever have. 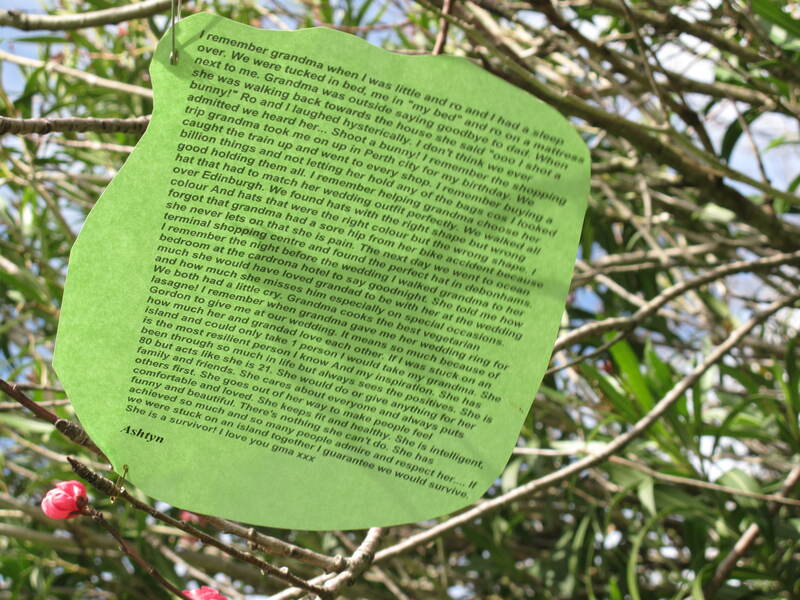 To have assembled messages and anecdotes from every one of my immediate family members, ages 12 and on up to my kids in their 50’s,was a marathon, and your creativity in photographing each message against a backdrop of the farm garden, could have only be devised by you. Your poem and the prayer quotes, once again reveal your beauty and talent and I am the most fortunate of women. Love you forever sweet Daughter. Mother. You win the competition for the best response haha! Thanks so much! I will catch up on your blog asap – looking forward to it. No worries, it’s not going anywhere. Happy Birthday to your dear mom! I think of us as old friends now Paulette! This is just beautiful, enjoy that cruise also! I am sure she had a wonderful birthday. I still can’t believe she is old! You are a gem Diana! I like the idea of a birthday boat cruise. We’ve never done it before so it should be interesting. I’ll bet others besides me who would like to read more of THE book! What a nice 80th birthday! I’ll take some photos and post! how absolutely wonderful and i’m sure she loved the book! She did! And today she is busy taping up the pages that keep falling out ha! I just knew she would love such a wonderfully thoughtful, personal gift, falling apart or not! Happy 80th to Meg! Wishing your whole family a joyous celebration this weekend. Sorry I have lost touch with your blog (and others) a bit – back on track next week. Happy Belated Birthday wishes to your mum, Julie. I’m sure the book was a HUGE hit.